DURHAM, N.C. (APRIL 11, 2019) - A study released today in STEM CELLS shows how a new class of cancer drugs, called Smac mimetics, is effective in killing off the stem cells that lead to glioblastoma (GBM) depending on oxygen level. This might help pave the way to a new, more efficient method for treating the most common and aggressive form of brain cancer in adults. Researchers have long known that GBMs are derived from cancer stem cells and for a treatment to be successful it is essential to get rid of them. 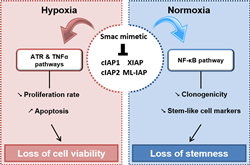 However, they faced a major challenge: The GBM stem cells are often located near or in low oxygen (hypoxic) areas. This environment maintains the cells’ self-renewal properties and heightens their resistance to treatment, too. A previous study by the research team, led by Aurélie Tchoghandjian, Ph.D., and Aurélie Soubéran, Ph.D., of Aix-Marseille University, revealed that the Smac mimetics compound GDC-0152 increased the survival of mice with GBM. The present study was designed to learn how altering the oxygen level might affect GDC-0152’s efficiency. The team ran their test using a 3D glioblastoma spherical model and several glioblastoma cell lines collected from donated human tissue. The results showed that high oxygen levels caused the GBM stem-like cells to lose their stem cell properties. The full article, “Inhibitor of apoptosis proteins determine glioblastoma stem-like cells fate in an oxygen-dependent manner,” can be accessed at https://stemcellsjournals.onlinelibrary.wiley.com/doi/abs/10.1002/stem.2997. About AlphaMed Press: Established in 1983, AlphaMed Press with offices in Durham, NC, San Francisco, CA, and Belfast, Northern Ireland, publishes three internationally renowned peer-reviewed journals with globally recognized editorial boards dedicated to advancing knowledge and education in their focused disciplines. STEM CELLS® (http://www.StemCells.com) is the world's first journal devoted to this fast paced field of research. THE ONCOLOGIST® (http://www.TheOncologist.com) is devoted to community and hospital-based oncologists and physicians entrusted with cancer patient care. STEM CELLS TRANSLATIONAL MEDICINE® (http://www.StemCellsTM.com) is dedicated to significantly advancing the clinical utilization of stem cell molecular and cellular biology. By bridging stem cell research and clinical trials, SCTM will help move applications of these critical investigations closer to accepted best practices.